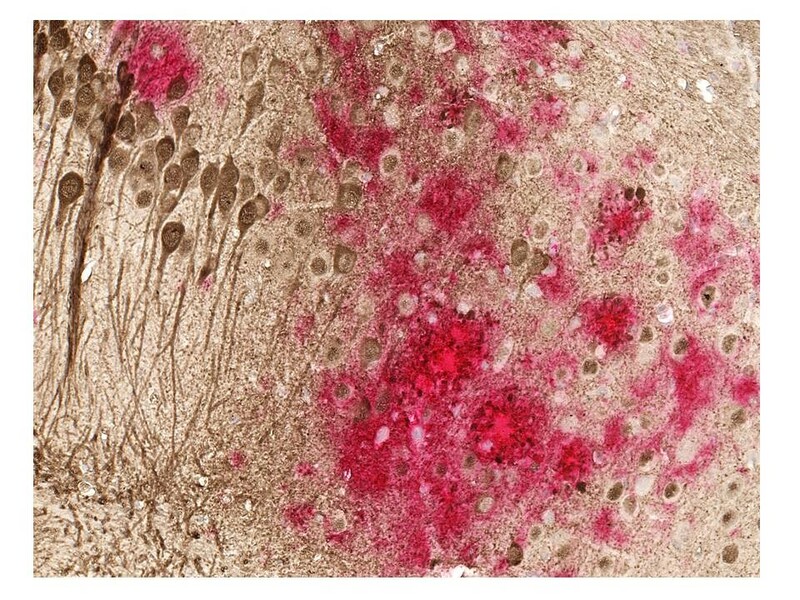 What if you could get an Alzheimer’s vaccine like you do for measles or chickenpox? Scientists at University of Texas Southwestern Medical Center are hoping that day isn’t too far off based on the results of a study using mice. Researchers claimed to have found a vaccine that stopped the accumulation of the beta-amyloid and tau proteins in the brain, two of the biomarkers of Alzheimer’s and the two most popular targets for Alzheimer’s drugs. They tested the vaccine, delivered via a shot through the skin, on mice who have been genetically engineered to produce the plaques and tangles associated with Alzheimer’s. The shot is made up of DNA from Alzheimer’s proteins that can “teach” the body how to eliminate the proteins in the brain. The injection is called Aβ42, and it makes a three-molecule chain of the protein. The body then produces an antibody, which was shown to stop the build-up of both amyloid and tau. In the mouse study, the vaccine lowered beta-amyloid by 40 percent and tau by 50 percent. This isn’t the first time anti-amyloid drugs have been tested. But in the past, they caused swelling of the brain. This vaccine triggers an immune response that doesn’t result in swelling. If amyloid and tau are the cause of Alzheimer’s, this could be a potential therapy that could slash the number of people with the disease. But some scientists don’t believe that beta-amyloid and tau are in fact the cause of Alzheimer’s. Some people have the proteins in their brain, but never get Alzheimer’s. Other scientists point to inflammation as the trigger for the disease. “We know that inflammation has different phases–early on it can be protective against a threat by actively degrading it, but if the threat is not removed, then persistent inflammation actually causes cell death,” Professor Robert Richards, from the University of Adelaide’s School of Biological Sciences, told Being Patient. However, if beta-amyloid and tau are behind Alzheimer’s, another hurdle would be to get this vaccine to people who are at risk before the disease starts to deteriorate the brain. Currently only a PET scan or a cerebrospinal fluid tap can determine whether Alzheimer’s is at play in the brain, though scientists are working on early diagnostic tests like an MRI, eye scan and even a neck scan. “The vaccine would be offered to those over 60 years who show evidence of mild cognitive impairment or early Alzheimer’s disease based on a neurological examination, neuropsychological tests, clinical laboratory comprehensive metabolic profile tests, and abnormal levels of [beta-amyloid and tau] in the cerebrospinal fluid and increased accumulation of [beta-amyloid] and tau in a brain PET scan,” said Rosenberg. The patient would need to be cleared of other issues that might be causing memory loss, he added. But scientists have high hopes for this vaccine. The mice whose plaques were cleared are currently undergoing cognitive tests to determine if reducing the beta-amyloid and tau also improved their cognition, said Rosenberg. “It is expected that DNA Aβ42 trimer immunotherapy in a clinical trial will reduce both plaques and tangles in patients with [Alzheimer’s disease],” wrote the study authors.